The flowering linden tree (Tilia), also known as basswood, grows to a height of 80 feet. 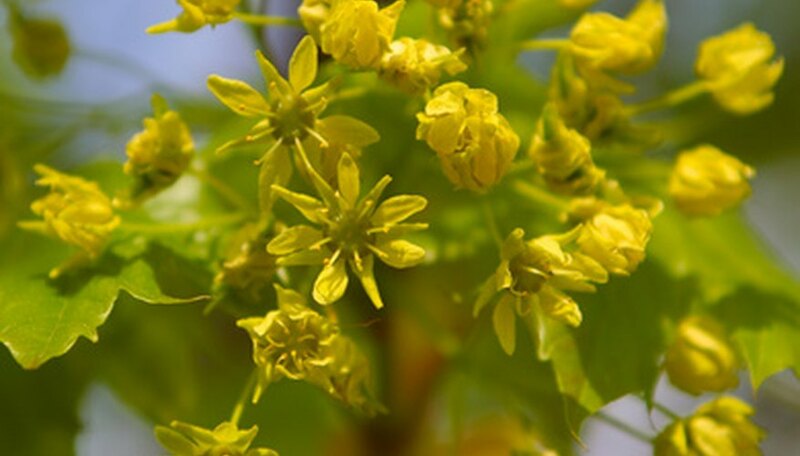 Large, long-stalked clusters of five to 20 fragrant flowers appear in June and July. Bees flock around the yellow flowers to collect the coveted nectar which is rumored to make the best white honey in the world. Leaves grow up to 8 inches in length and 5 inches in width with distinct coarse-tipped margins. The trunk of the linden tree grows upright in a straight pattern and is quite tall prior to branching. Young trees sport light brown bark, but as they age, the bark becomes deeply furrowed and thick in appearance. The crown appears broad and spreading. Most varieties of linden have leaves that are dark green on top with a soft, almost white underside that has light fur. The leaf bracts suspend large clusters of summertime flowers. Each bract resembles a leaf and measures 5 inches in length. Following flowering, round fruit appear. The tiny fruit measure 1/3 inch in diameter and contain one or two seeds. The fruit are attached to the tree with a bracket that is strap shaped. The wind helps release the fruit from the tree. The bracket carries the fruit on the wind for seed distribution. The linden tree grows from Canada southward to the Florida Panhandle. It occurs as far east as the Dakotas and south to Oklahoma. The Tilia caroliniana occurs through Texas to Mexico and all the way to the Carolinas. The flowering linden grows in hardwood forest settings and in valleys. It prefers moist, well-drained soil. The tree does not tolerate drought well. The linden tree produces light-colored wood that is soft and pliable. The grain is straight, which makes it popular for cabinets. The wood is also popular for building musical instruments. Linden wood is used in pulp production as well. What Is a Linden Tree?